One of the new projects we have at foam kernow is a ambitious new extension of the egglab player driven camouflage evolution game with Laura Kelley and Anna Hughes at Cambridge Uni. 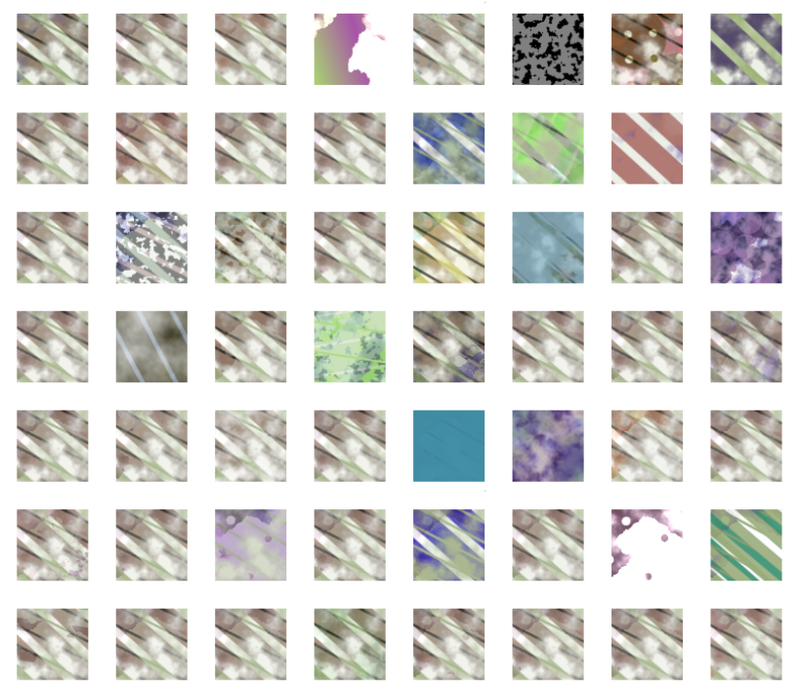 As part of this we are expanding the patterns possible with the HTML5 canvas based pattern synthesiser to include geometric designs. Anna and Laura are interested in how camouflage has evolved to disrupt perception of movement so we need a similar citizen science game system as the eggs, but with different shapes that move at different speeds. 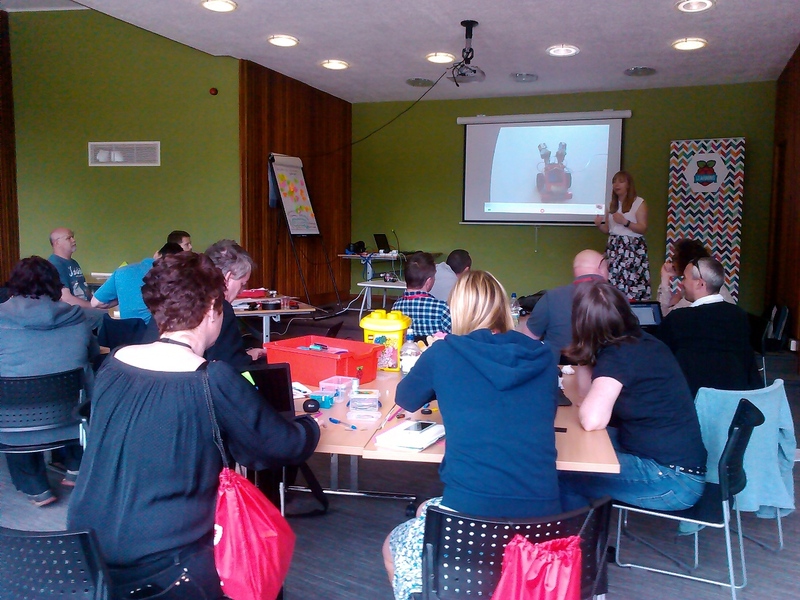 We recently had the second inset training day in programming related activities at Truro school. Following on from the previous session I didn’t want to introduce too much new stuff, so we concentrated on going back over Sonic Pi and Minecraft/Python programming in the morning, then discussed a lot more about our future workshops in the afternoon. These will include children from most of the primary schools in the Truro area and take place during the next term. I also wanted to use the day to work on some specific ideas the teachers wanted to get going. One of these involved running a Kinect camera with the Pi, which we managed to get more or less working – reading depth data in Python for potentially plugging into Minecraft at a later date. The big idea I wanted to get feedback about was the use of robotics and electronics in conjunction with code (the photo above is my desk while preparing the day before). I didn’t have any lesson plans for this, but based on some comments from the first workshop and from playing a bit with this during CodeClub teaching I felt it might be good with this age group, who already know quite a bit about screen based activities. To keep costs down (as well as building in issues like e-waste) we’re planning to make use of recycled junk to extract motors from toys and hack them to do different things. It seems this doesn’t cause too many issues from safety POV (everything will be low-voltage and we can check everything beforehand), even the use of soldering irons seems to be acceptable as they have supervision. The advantage of using code to move real things (as shown by a long history) is that it directly connects programming with the world outside of the screen (where it most certainly now has great importance in our lives), and at the same time results in teamwork – as it’s not easy for a single person to make a robot while programming it. When we tried this at Troon Primary they self organised into a group with one person programming while another was building stuff in lego and a third provided excited communication between them and more or less managed the task. 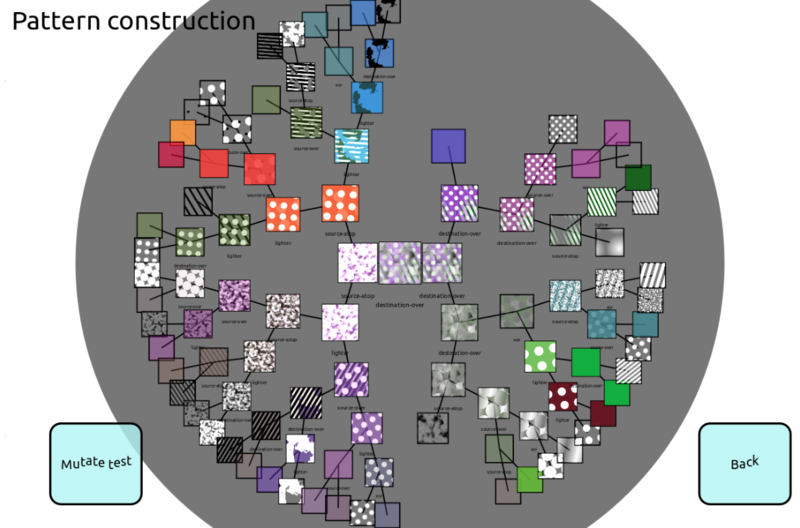 Other programming activities tend to be more individualistic – with the possible exception of networked Minecraft, which is important but a very different form of collaboration. Work on cricket tales the last few weeks has been concerned with scaling everything for the sheer amount of data involved. 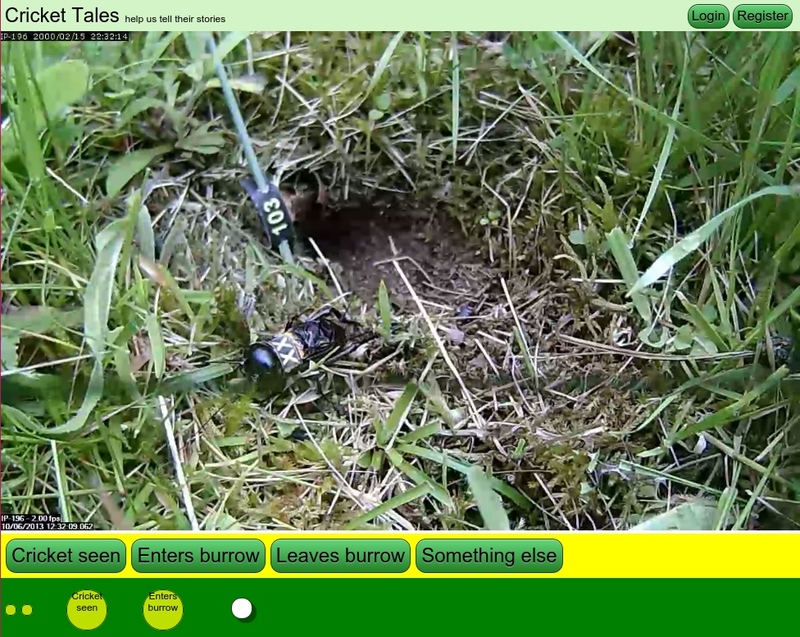 The numbers are big – we’re starting with the footage from 2013 as a test (a ‘smaller’ year), where 145 cameras recorded in total 438 days worth of video of cricket burrows. Our video processing robot is currently chopping this up into 211,889 sped up one minute clips, and encoding them into webm, ogg and h.264 mp4 for maximum browser compatibility. It looks like this would take a few months to do in total, and over the last week or so we have 8,000 videos processed. 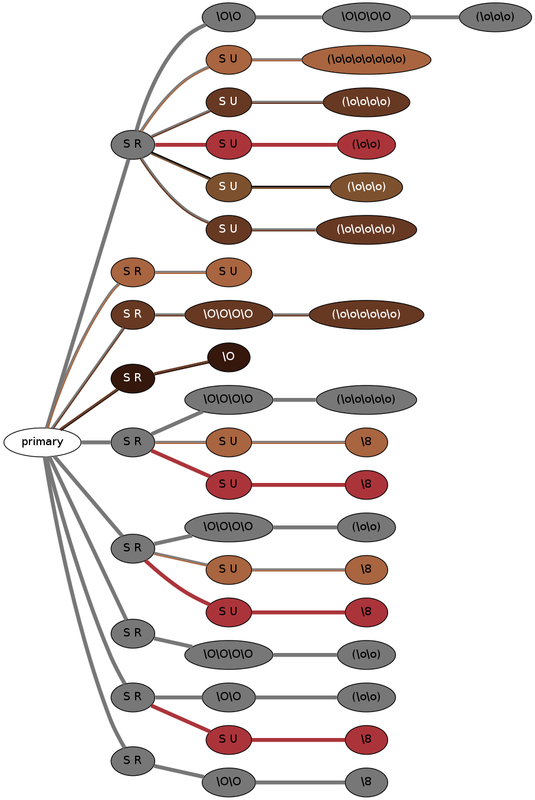 Now we have a framework in place that will support this quantity of data, for example we can be continuously processing video while people are tagging – and swap them in and out so we don’t need to fit them all on disk. The database contains an entry for every video with a status (currently ‘not encoded’, ‘ready’ and ‘complete’). Movies could be marked complete after some number of players have watched it or some correlation metric with their tags has been met, then the files can be deleted off the disk. 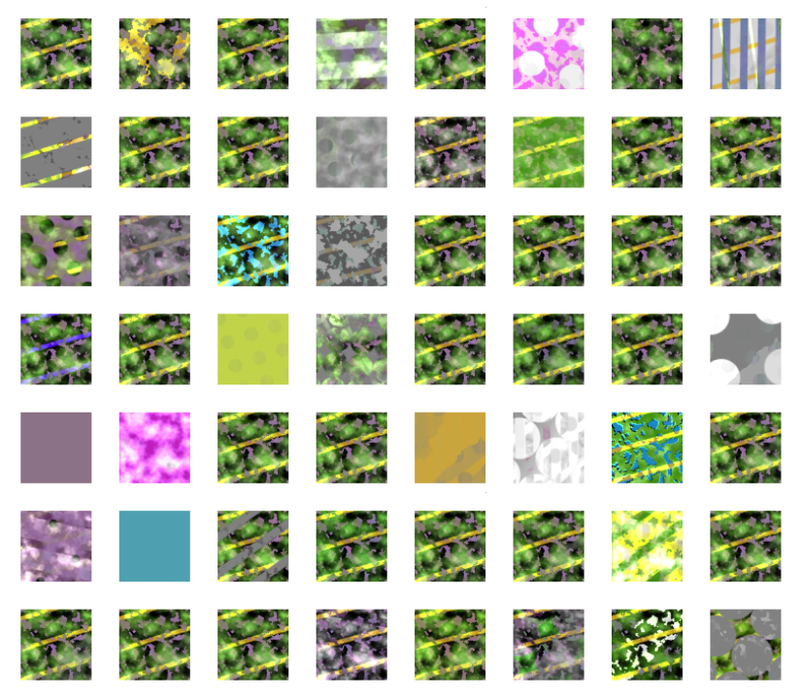 In terms of feasibility, we had 68K people playing the camouflage citizen science games over the last year – so if we managed to get that many people we’d need them to view 3 minutes each to get the entire dataset watched once. This is a fictional map of the cricket’s burrows, with the name of the player who contributed most to them so far displayed – one idea for the ‘play’ element, which is the next big thing to consider. This is a balance between making it quick and fun and making people feel like they are contributing to something bigger and being able to see a tangible result for their efforts. Do we aim for something that takes someone five minutes of their time and getting enough people to make it work, or do we aim for a smaller number of more dedicated players who keep coming back? We have loads of options at this point, and to a large extent this depends on the precise nature of what the researchers need – so we need to do some more thinking together at this stage. 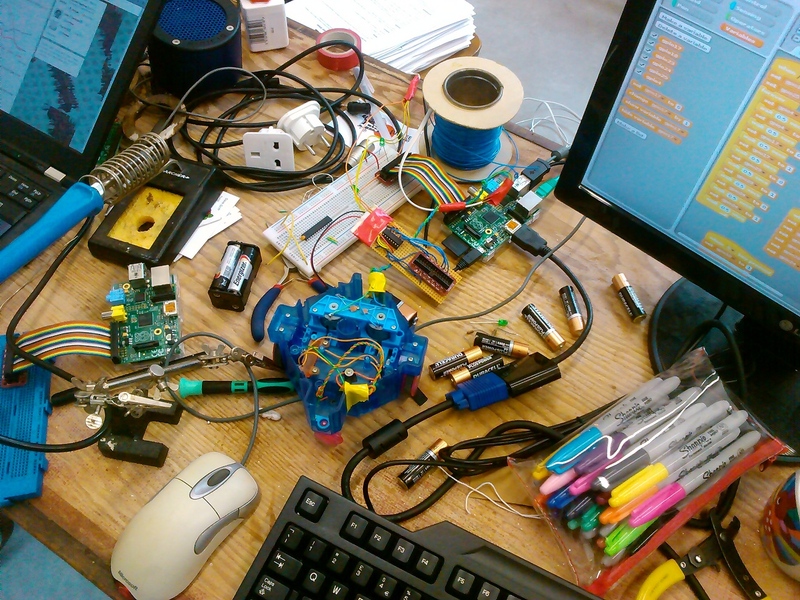 Last week I had the chance to help out the Raspberry Pi foundation at their Picademy in Exeter. It was good to meet up with Sam Aaron again to talk livecoding on Pis, and also see how they run these events. They are designed for local teachers to get more confident with computers, programming and electronics to the point where they can start designing their own teaching materials on the second day of the two day course. This is a model I’m intending to use for the second inset teacher training day I’m doing next week at Truro school – it’s pretty exciting to see the ideas that they have for activities for their pupils, and a good challenge to help find ways to bring them into existence in a day. 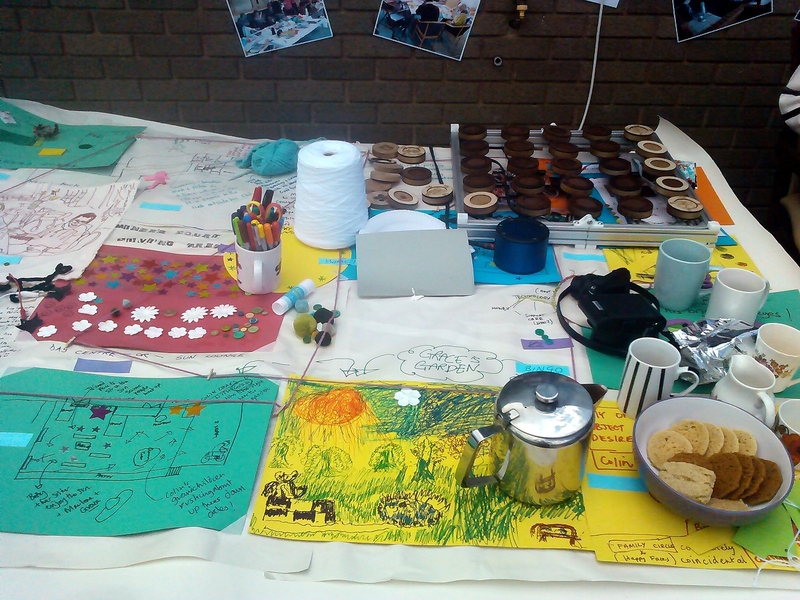 We also had the ending of Future Thinking for Social Living at the Miners Court summer party last week. We exhibited the map made during the workshops, made lots of tea, and had some fun with the pattern matrix in musical mode out in the garden – I adapted Alex’s music system we used with Ellen in Munich to run on Raspberry Pi so it didn’t require a laptop, or a screen at all – simply a speaker. It was interesting how quickly people got the idea, in many ways music is easier to explain than weaving as listening while coding is multi-sensory. Following on from our session last week on Quipu sonification, Julian and I wrote a blog article with some audio on the weavecodes project site about trying to understand these undeciphered Inca hard drives with sound. 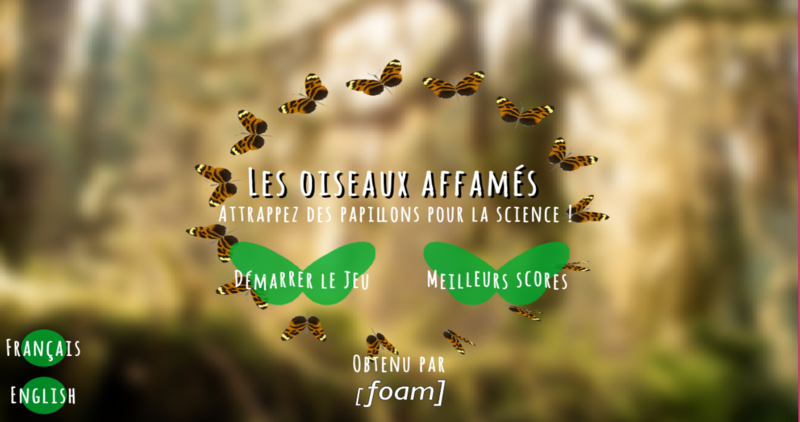 One of the three citizen science game projects we currently have running at Foam Kernow is a commission for MÃ³nica Arias at the MusÃ©um national d’Histoire naturelle in Paris, who works with this research group. 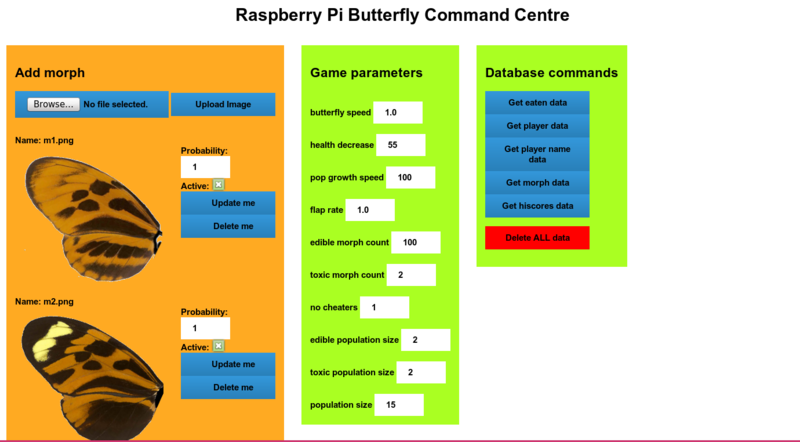 She needed to use the Evolving butterflies game we made last year for the Royal Society Summer exhibition to help her research in pattern evolution and recognition in predators, and make it into a citizen science game. This is a standalone game for the moment, but the source is here. We had several issues to address with this version. Firstly a lot more butterfly wing patterns were needed – still the heliconius butterfly species but different types. 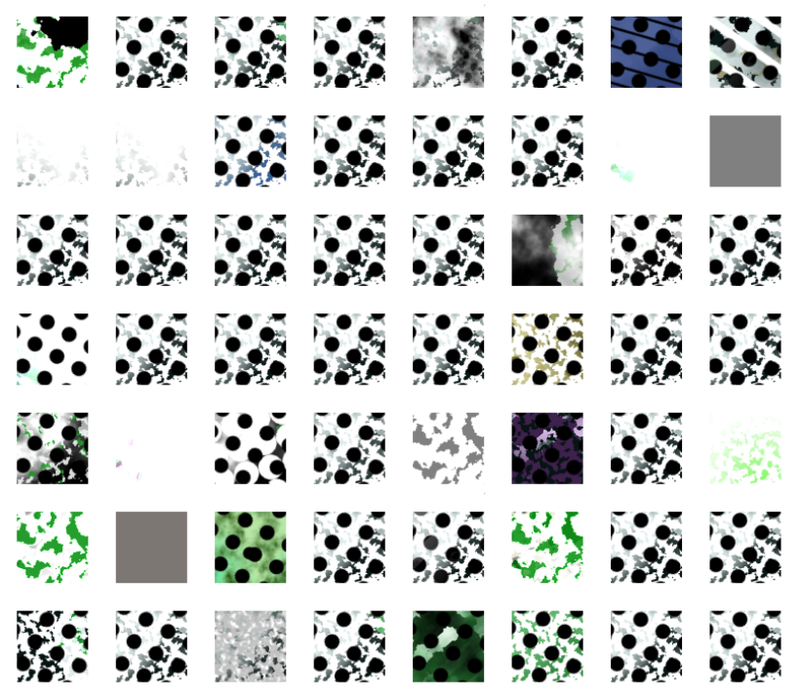 MÃ³nica then needed to record all player actions determining toxic or edible patterns, so we added a database which required a server (the original is an educational game that runs only on the browser, using webgl). She also needed to run the game in an exhibition in the museum where internet access is problematic, so we worked on a system than could run on a Raspberry Pi to provide a self contained wifi network (similar to Mongoose 2000). This allows her to use whatever makes sense for the museum or a specific event – multiple tablets or PC with a touchscreen, all can be connected via wifi to display the game in a normal browser with all the data recorded on the Pi. The other aspect of this was to provide her with an ‘admin’ page where she can control and tweak the gameplay as well as collect the data for analysis. This is important as once it’s on a Raspberry Pi I can’t change anything or support it as I could in a normal webserver – but changes can still be made on the spot in reaction to how people play. 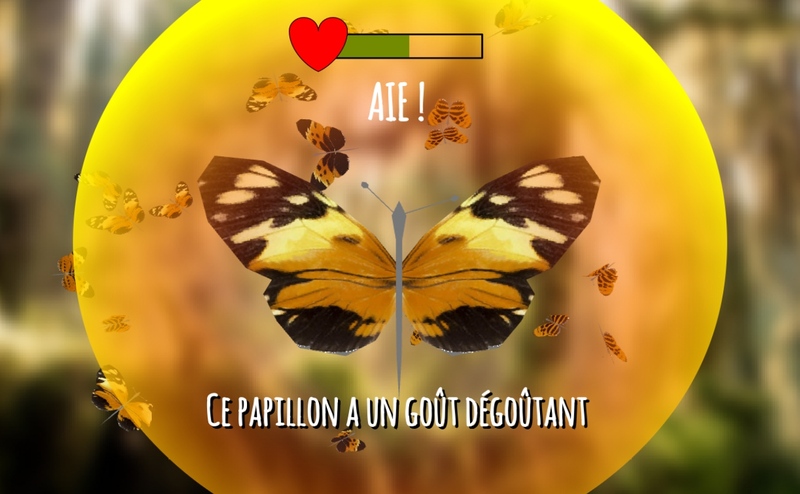 This also makes the game more useful as researchers can add their own butterfly patterns and change how the selection works, and use it for more experiments in the future.